y(OUR) Story is a collaborative production hosted by Wellness and Prevention Services. 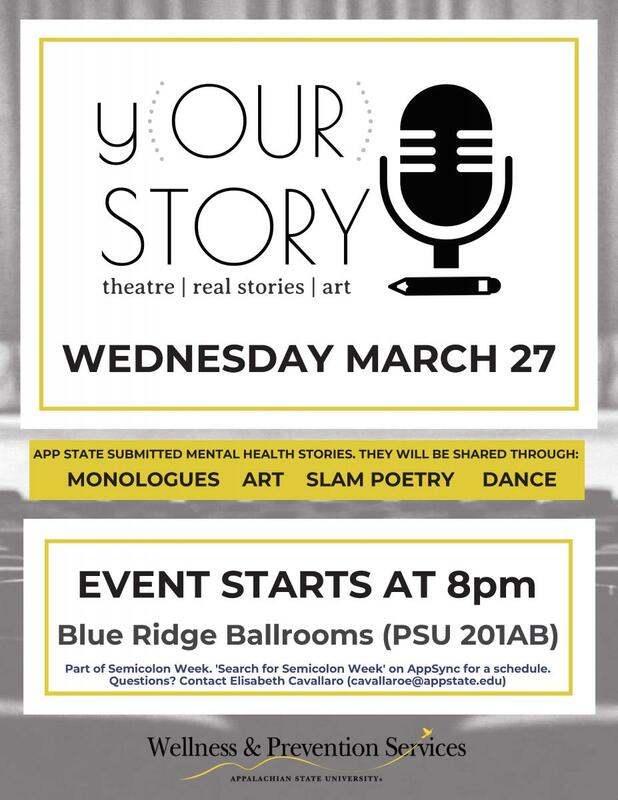 Through partnering with actors, dancers, painters, poets and other artists, mental health stories submitted by people in our Appalachian community will be shared. This event hopes to inspire those struggling with their mental health to not give up, and to bring conversation about mental health out of the shadows and into the light. Don't miss Honors first year student and Chancellor's Scholar Cielo Murillo-gomez performance in y(OUR) Story. Cielo is a theater arts major and psychology minor. Your story is (our) story. You are not alone. *Please note that stories do touch on heavy topics, such as suicide and sexual assault and that the show may not be appropriate for children.